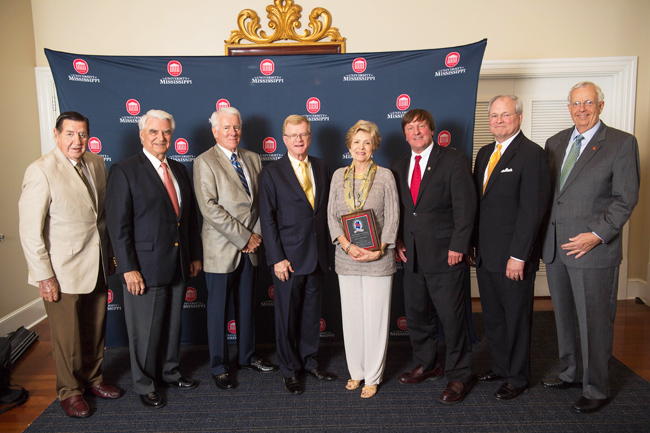 The annual Patterson School of Accountancy awards banquet was held on April 27, 2017, at The Inn at Ole Miss, honoring its newest Hall of Fame inductee posthumously, alumnus Don Jones (BBA 66, MAccy 67). His wife, Melissa, and family received the award on his behalf. The Patterson School Hall of Fame was established in 1989. The inaugural inductees included Dr. Clive F. Dunham and Mr. Eddie DeMiller (BA 39). Pictured left to right are past Patterson School of Accountancy Hall of Fame inductees: Arnold Young (BBA 54), Joe Weller (BBA 61), Bill Hope (BBA 66, MAccy 67), Jimmy Davis (BBA 62, MS 63, PhD 72), Melissa Jones (BSC 68), wife of 2017 inductee Don Jones, Dean Mark Wilder, Charles Clark (BBA 72) and Guy Moore (BBA 72).